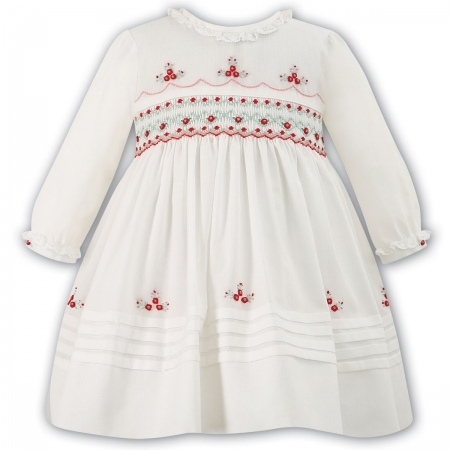 Traditional smocked ivory dress by Sarah Louise. Smocked across chest in red and turquoise threads and decorated by embroidered little red flowers throughout. Bottom of the dress is pleated. Frilly collar and cuffs. Fully lined. Made by Sarah Louise of England. Buttoned at rear. Tied with a bow. Made with top quality 65% polyester 35% cotton voile fabric. This pink smocked girls white dress is available to purchase in person from stock in our shop in Ashford Middlesex. You are welcome to visit us if you live near by. Sizing guide: 6 months is for 3-6 months. 12 months is for 6-12 months and so on.